April is when we start to spend more time visiting our inland areas, but the coast can still deliver real quality, and quantity, at this time of the year too. I’d arrived at Church Point, to collect Ian, Rosie, Ali, Vicky, Suzie and Aravind, and then had a voicemail on my mobile. One of their cars had a problem, so they’d taken it to CarBar. A quick change of plan and I collected them from Morpeth instead, and we headed towards the southeast Northumberland coast in search of Otters. Goldeneye were displaying, Redshank and Curlew were probing the gooey mud and a Little Egret caught a fish and then dropped it and just stared at the water without refinding it’s prey. Rosie had just asked where Otters were most likely to be seen on the stretch of water we were looking at, I turned to indicate the general area that I thought would be most productive…and there was an Otter 🙂 We watched it for a few minutes as it fed, and I was fairly sure it was one of the young female Otters we’d watched regularly since December. Each time the Otter dived we could follow it’s movements by the trail of bubbles on the water’s surface but it soon vanished from view, as they often do, and everyone’s attention remained focused on the water. 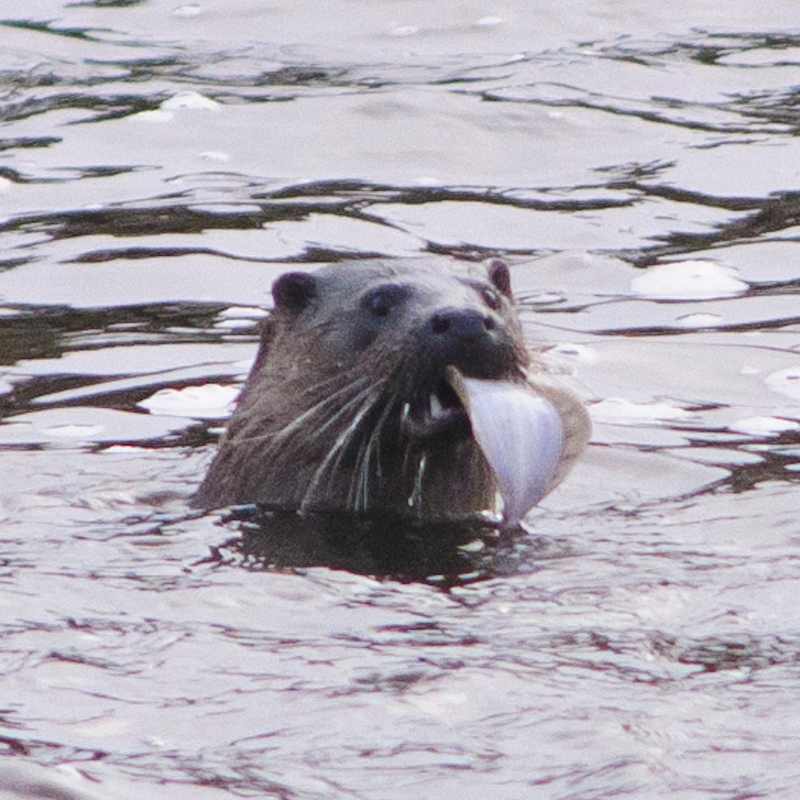 Then another Otter popped up. This one was a bit of surprise though; a very small cub that isn’t any of the four animals we’ve been watching over the last few months. It surfaced like a spyhopping dolphin before sliding back beneath the waves then an adult surfaced just beyond the cub, and we’d seen three different Otters 🙂 Rosie then spotted another mustelid, and the Weasel engaged in a game of peek-a-boo from a stone wall before running along the bank. In the 17 years that I’ve lived here, I’ve always believed that Northumberland is one of the finest counties for birdwatching in the whole of the UK. That belief played a big part in reaching the decision to launch NEWT, and it’s why we’re such an enthusiastic member of the Birdwatching Northumberland Consortium. We’ll be at the Bird Fair in August (Marquee 1, Stand 53/54) so come along to meet us and find out just how good Northumberland is. This morning, though, my attention is on mammals. We don’t do too badly for them either; Badger, Red Fox, Grey Seal, Red Squirrel, Roe Deer, Weasel, Stoat and Brown Hare all feature regularly on our safaris and, on our Northern Experience Pelagics, there’s the possibility of Minke Whale, White-beaked Dolphin, Harbour Porpoise and other cetaceans. We’ve had some random sightings as well; a Bank Vole that sat munching on a leaf just a few feet away from us and a Mole that walked into a hide we were sitting in were both bizarre (especially the Mole; I hadn’t seen a live one for a long, long time). With the exciting news earlier this week of the first confirmed evidence in 16 years of Pine Marten in Northumberland, we’ve got a new challenge 🙂 We’ve spent some time in the last couple of years checking likely sites and following up reports that we’ve received. Some of those have been very tantalising, and the species may be more widespread than people imagine. Otters and Badgers are fairly difficult, but we’ve developed an excellent track record with those two species. Pine Marten is going to be an altogether different proposition, but we relish a challenge.